Positive outlook:US treasury secretary Henry Paulson says he is optimistic about a nuclear energy agreement between the US and India. He says the agreement will be good for both countries. 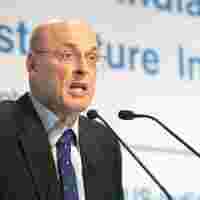 New Delhi: US treasury secretary Henry Paulson said the slump in the housing market in the world’s biggest economy wasn’t over yet. “We haven’t hit the bottom yet in housing," Paulson said on Tuesday at the Fortune Global Forum, organized by Fortune magazine. The fallout from the US subprime market has cost the world’s biggest securities firms and banks more than $30 billion (Rs1.2 trillion) in bad loans and trading losses in the third quarter. Goldman Sachs Group Inc. CEO Lloyd Blankfein said at the same conference that the housing crisis is a “concern" and he expects a regulatory reaction to the fallout. US manufacturers fired workers for a 16th consecutive month in October, while declines in subprime mortgage lending and homebuilding led to job losses at construction companies and financial institutions. Federal Reserve policy makers will lower the target interest rate again this week to sustain the expansion through the real estate crash, economists said. Still, the US economy was resilient enough to overcome the housing crisis, Paulson, a former head of Goldman, said. “There is enough strength in the economy that we can grow through this," the official said. “We have a strong global economy. We have a strong US economy that is creating jobs every day." Paulson said a strong dollar was in the interest of the US. “I am strongly committed to a strong dollar," he said. The dollar on Monday reached 1.4438 against the euro, the lowest since the European currency’s debut in January 1999. The dollar’s value should be set in markets, based on fundamentals, he said. Paulson said he was optimistic about a nuclear energy agreement between the US and India. “We value that India must come to its own conclusion" on the agreement, which is good for both countries, he said. Paulson is ending a four-day visit to India, his first to the world’s most populous democracy as a government official. His visit comes as Prime Minister Manmohan Singh’s government fights to overcome domestic political opposition to the 2005 civilian nuclear agreement with the US. India should work to complete the accord in the next several months to avoid harming relations between the two countries, US undersecretary of state Nicholas Burns had said in a speech last week. Completing the accord would end a 33-year period during which India was unable to get fuel and technology from overseas. Nuclear sanctions were imposed against India after it carried out an atomic test in 1974. Under the agreement, the US would accept that India, which conducted nuclear tests again in 1998, operates its civilian and military programmes outside the nuclear non-proliferation treaty. US President George W. Bush and Singh agreed in July 2005 that US companies would sell India nuclear technology, opening a market for equipment, fuel and reactors from Fairfield, Connecticut-based General Electric Co. and Monroeville, Pennsylvania-based Westinghouse Electric Co., a unit of Toshiba Corp. of Japan. Singh has told Bush that he faces “difficulties" on the nuclear agreement, following resistance by the ruling coalition’s communist allies. The support of the four communist parties is key to the government’s survival. Singh’s Left allies contend the accord will weaken India’s ability to follow an independent foreign policy and compromise its own scientific capability. They want the agreement to be delayed until it is debated in Parliament. The communists have also asked the government not to discuss power plant safeguards with the International Atomic Energy Agency (IAEA), a necessary step in making the agreement operational. India also needs to reach agreements with the 45-member Nuclear Suppliers Group before Bush can take the accord to the US’ Congress. Harichandan Arakali in New Delhi and John Brinsley in Washington contributed to this story.